Well Easter was great kitefishing weather and as Ross mentioned in his report to you a couple of weeks ago, some good fish were taken by himself and others. There were a lot of out of town kite fishers enjoying themselves although I did hear of a five kite tangle up off Seaview Motor Camp. My spot, slightly to the north is good for avoiding mishaps as I am the only one who fishes there. My catch numbers on snapper are dropping as the cooler weather arrives but I did manage another 20lb plus beauty a few days after Easter. 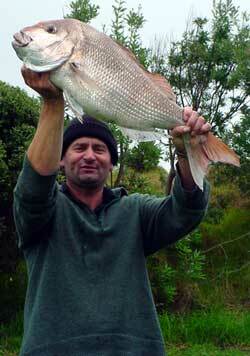 The fish took second place on the snapper of the month ladder at the local fishing club. Local kitefisher Tony Johnson is catching 10 to 15 gurnard per set along with snapper using kahawai and trevally for bait. I am still using strips of squid for bait to target snapper and consequently pick up only the odd gurnard as gurnard don't seem to like squid bait very much. 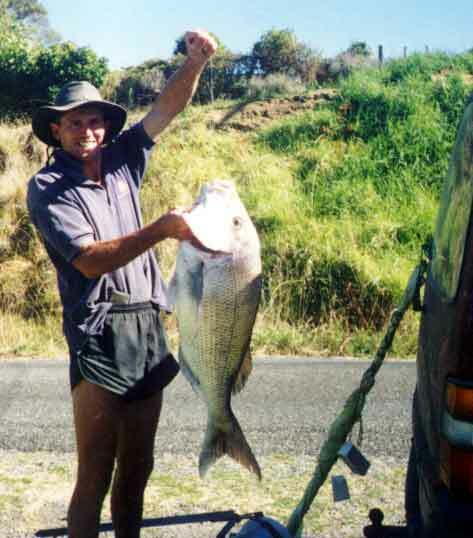 Kitefishing a bottom longline rig from Baylys Beach in late November, 2002, Rick ran two sets baited up with fresh Kahawai. Rick runs only 16 to 18 hooks per set on the west coast, even though the maximum allowed is 25, because the gear is much easier to set through the strong rip with fewer hooks. From the two sets on this day Rick caught this fantastic 12.02 kg snapper, 2 kahawai, and 12 other snapper ranging in size up to 2.5kg. I spoke with Rick earlier this week and he reported that the winds were perfect last Sunday for kite fishers fishing from Baylys Beach. There were a lot of kite fishers along the beach and all of them were catching good fish. Rick ran 2 sets with his bottom longline rig on Sunday and caught 10 snapper, most of them were school sized but the biggest two were 2.8kg and 4.5kg. Rick also landed one kahawai and a gurnard, all taken again on fresh kahawai which Rick swears by. Muriwai Beach from Willie Kipa. 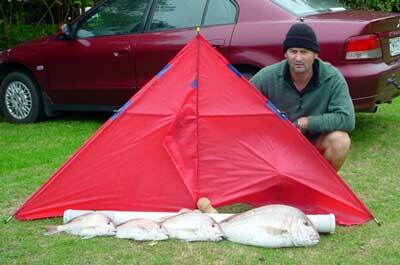 Last Sunday we fished our Paul's Fishing Kites longline rig around four kilometres north of Rimmer Road beach access. The wind was a strong northeast and the surf was calm. Hi. I haven't been out kite fishing lately but I hear the fish are still about. Alan Place and I went out flounder spearing on the Kaipara recently. We got a total weight of 9kgs of both silver and yellow belly flounders. We spear them when the tide is out by walking the shallows in the channels and using a Coleman white spirits lamp. The flounder live in these areas and survive almost totally on the very small mud crabs which are extremely abundant. Three weeks ago I ran a boat set line off the point on the farm. I made up the line of spare bits and pieces but still used the running clip system. I caught one good sized kahawai and one XOS stingray which must have gone 70 lbs. That was a load of fun pulling in by hand. April 19 and 20 provided moderate easterly winds in the Taranaki region and we headed out kitefishing with our dropper rig at Seaview Beach. We put out three sets of 10 hooks each baited up with squid, the surf was slight, the tide was coming in and the gear headed straight offshore. We caught 13 snapper and one gurnard on 5/0 Target Hooks. It was a great morning fishing off the beach on Saturday. 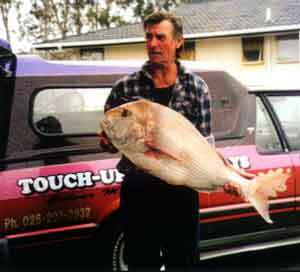 The first set returned five snapper with the largest being 8kg. The second set returned three snapper. On Sunday I only ran one set and caught five snapper and a gurnard. Both days were cool, but good for Paul's Kites!!" You are correct, at the moment our catch report cannot take attachments. I had another great day fishing with the young fella on the kitefishing club day last Sunday. We went to Rimmer Rd at Muriwai expecting 10 to 15 knots of wind but getting only 2 to 8 knots. We fished solidly and did five 10 hook sets over the top of the tide. Initially our fishing distance was restricted due to big rip going up the beach even though the surf was slight. I finally managed to launch my second kite after the change of tide and then was able to lift the main line clear of the waves and rip. We had great days fishing with plenty of species variety, and all were good solid sized fish. Over the day we caught three snapper, four gurnard and a couple of kahawai on salted mullet baits. As the winds were very light we were only setting 10 hooks at a time. We had a huge birds nest on the hook section on one set after hooking a good sized kahawai and 2 large gurnard. I simply unhooked the tangled hook section and replaced it with the spare second hook section and spare traces. I was certainly glad I had the spares on hand and didn't have to untangle the gear on the beach. It would have been a waste good fishing time. Also this was the first day of good hard fishing for my new motorised reel...worked like a dream and saved the young fella a lot of arm work. Have got a couple of mates and we are going out again in a couple of days for a mid-week excursion when fewer motorbikes and beach buggies are tearing up the beach. A 6am start to the day saw me paddling my kayak 1500m off the Papamoa Beach to set out my long line and try my luck with rod and reel. I baited the long line with salted mullet, blue mackerel, and squid on alternating hooks to see if the fish had a preference, then anchored up nearby to fish with my rod. After 15 minutes I had my first gurnard, which weighed about 1.2 kg followed by a lot of large paddle crabs, which just loved my pilchard baits. With the crabs taking most of the baits I decided to check the longline as it had been set for an hour. The result was 5 more gurnard from 1 to 1.5kg and the preferred bait for the day was the salted blue mackerel. So by 8am I was off home again with a nice feed of gurnard. PS. last week in the same spot I caught five snapper from 1.5 to 2.5kg caught on rod & reel using pilchard baits.